The reliable, secure and easy-to-use Tribal communication technology. The ability to quickly alert your entire Tribe and collaborate with council members and responders is vital for keeping reservations connected and safe during a crisis. Regroup provides state-of-the-art Tribal communication technology that allows you to reach members in multiple and remote locations. Regroup’s cost-effective, all-in-one solution is idea for critical and day-to-day communications. Its ease of use eliminates the learning curve and its robust feature set is the perfect complement to emergency management and administrative plans. With automated severe weather alerts, Regroup can help keep the Tribe safe when inclement weather approaches. Its QuickConnect feature allows members to check in with their status or report the situation in their area. Regroup’s exclusive TipSafe Anonymous Reporting feature enables Tribal members to report suspicious activity privately and securely. Additionally, Regroup makes communicating Tribal business a snap. With customizable templates, you can quickly alert others of schedule changes and other news. And, Regroup’s QuickConference feature lets you easily connect with others, wherever they may be. Regroup helps Tribes and Nations maintain close communication with members and residents – even when geographically dispersed. 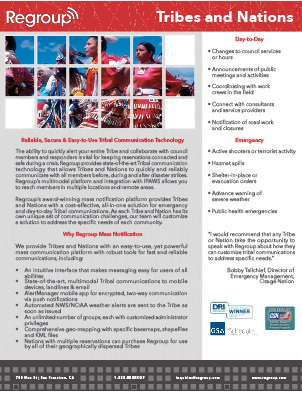 It’s a cost-effective solution for critical and day-to-day Tribal communications. Regroup for Tribes and Nations – our fact sheet shows why a mass notification system is an essential tool for safety, collaboration and more.